Today I went biking with Matt, Lisa, Åsa & Patric. We spent about 6 hours in the woods South of Stockholm. Firas, we rode the path around Rudan; then we took Sörmlandsleden out to Paradiset and back. It was fun and very challenging, and the weather was perfect. At Paradiset, we stopped for a snack and filled our water bottles with water pumped by hand from a well. Patric even managed to schmooze some chocolate cake from the folks there, who were holding the annual meeting for the Friends of Paradiset organization. We took several photos today, both with my (little pocket) camera and Åsa's somewhat more capable one. Åsa has posted the photos from her camera to her Picasa web gallery. 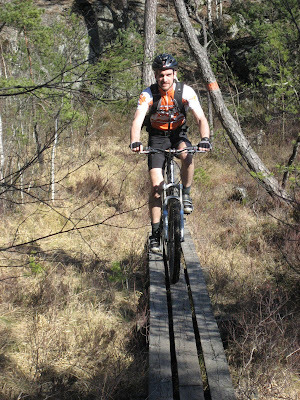 Patric took the above photo of me as I rode across a bridge over a bit of swamp. These makeshift bridges were all over the place, and I must say many of them weren't exactly designed for bikers. The boards were placed just a bit too far apaart in many places, making it necessary to ride on a single plank to avoid slipping between them! I'll post high-res versionf of Åsa's photos to my flickr photo stream soon, along with photos from my pocket camera.